Walking with your dog is supposed to be relaxing and fun for you both, but so often it is a struggle and anything but fun for either of you. Here are some of the top five problems and solutions dog parents often encounter on their walks. But you can take back the walk and make it worthwhile and enjoyable for both you and your dog. Does your dog go crazy at even just the sight of the leash? Photography ©K_Thalhofer | Getty Images. 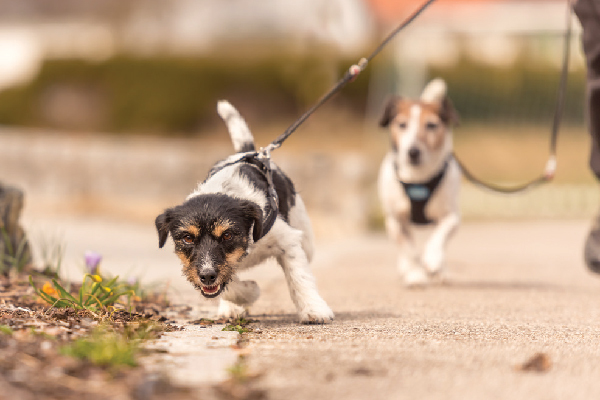 Your dog has paired the fun of a walk with the leash, and some dogs go “crazy” and jump all over their owners or twirl around so quickly it’s hard to even attach the leash. Don’t begin a walk in that frenzied state, as your dog is already worked up. And a dog in that state is likely to want to go, go, go once you get outside. Re-set this scene. Spend a week or two getting out the leash at various times but not going for a walk. Reinforce your dog when he’s near the leash and exhibits calm behavior. Work up to having your dog walk over the leash on the floor with no over-the-top reactions. Then do the same reinforcement as you attach and re-attach the leash several times a day but without heading out for a walk. The reinforced behavior should continue. The idea is to reframe what the leash means to the dog, and now you want it to mean either “Sit” or “Show me calm behavior.” When your dog gives you a calm behavior, then you can attach the leash and start the walk. Getting your arm nearly yanked out of its socket is no fun at all! Take a step back, and realize your dog isn’t pulling because he is a jerk; he’s pulling because he’s using his intensive sniffing skills or because he walks faster than you or because it’s simply fun for him. Start over by teaching your dog what a leash means in a controlled, boring environment. I attach the leash to a quality harness on the dog in the living room and toss a delicious treat behind me as I take small steps forward. When Fido catches up and looks up at me wondering if I have more treats, I mark it with an enthusiastic “Yes!” and toss another treat behind me. Repeat inside your home and then move to your back or front yard (or balcony or hallway in an apartment). Once these exercises go smoothly and your dog understands, resume re-training out in public spaces. Dogs are basically a nose with a body attached. Their world is nose driven and that’s because it is such an amazingly powerful thing. It may help to remind yourself as your dog is glued to the fire hydrant smelling and smelling the latest pee-mail, that other dogs use their noses to aid humans every day, such as cancer-sniffing dogs and police dogs. 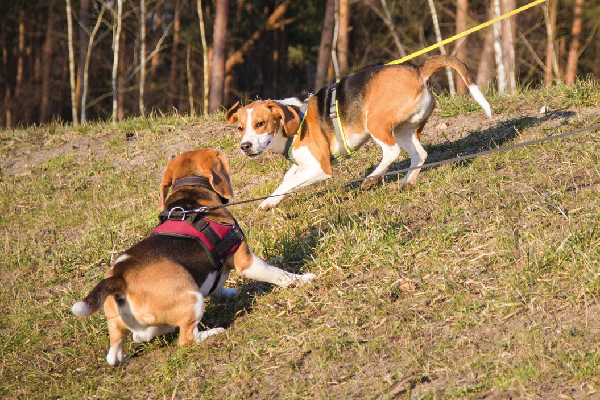 Trainers often beg dog owners to allow their dog to sniff on walks. You can still set some ground rules. Some of my clients begin the walk with a short jog or fast walk where the dog isn’t permitted to sniff. They put it on cue, such as “Let’s run!” Then in the middle of the walk they slow it way down and allow the dog to sniff and sniff some more. That can be put on cue as well, such as “Sniff!” or “Smell time!” Other clients start off with a long smelling spree and then tell the dog that’s enough and that sniff time is over. The important thing is that for a dog, the smell of a walk is probably more important than gaining an elevated heart rate from a run. How do you handle your dog reacting to other dogs while out on walks? Photography ©Christian Buch | Getty Images. This is a big topic. Many books have been written about just this issue because it’s very common and can be frightening to observe. If your dog is “going over threshold” (barking, lunging, not listening to you) on every walk, you need the help of a qualified professional. Punishing a reacting dog is not the right solution and will make your problems considerably worse. Reactive dogs are doing what they do from a place of fear. We need to help them learn they are safe from harm. I most often teach counter conditioning from a safe distance. A short way of explaining counter conditioning is to reframe what the dog feels on the inside about a threat or trigger. I want the trigger itself to cause chicken to fall from the sky. A reactive dog sees another dog in the distance, and that sight — the other dog — brings the dog at the end of my leash some terrific meat or cheese tidbit. All tidbits stop when the other dog (or skateboard, bike, car, etc.) is out of my dog’s sight. In other words, I want to pair yummy treats with the first sighting of a trigger. It’s important to get counter conditioning right, and human timing is paramount. Don’t hesitate to call in a professional, as the first few times you begin counter conditioning are the critical learning episodes. Your dog minds you beautifully at home, but walk out that front door and he seemingly goes deaf. What is happening? Being outside and smelling new things is highly stimulating for dogs. If we could see what they smell we would marvel that they listen to us at all! At the risk of sounding like a broken record, focus work begins at home in a controlled environment. I love playing a focus game I call “Find it,” but you can name it anything you want. I sit inside my home in a chair with a cup or bowl of tasty morsels. I throw a piece of great-tasting food over the dog’s head, and he goes to get it. Just as he is gobbling it up, I say his name. The second I see his ears turning toward me after I call his name, I say “Yes!” and toss another treat over his body. I repeat until he gets very good at turning toward me when I say his name. Once your dog does this easily and reliably at home, practice it on walks. Our dog’s attention is not a given. The more we train with high-value rewards to reinforce the behaviors we do want, the more those desired behaviors show up in the dog’s repertoire. With some time training at home, you and your dog really can learn to walk nicely together and both enjoy your daily walk. Thumbnail: Photography ©MightyPics | Getty Images.